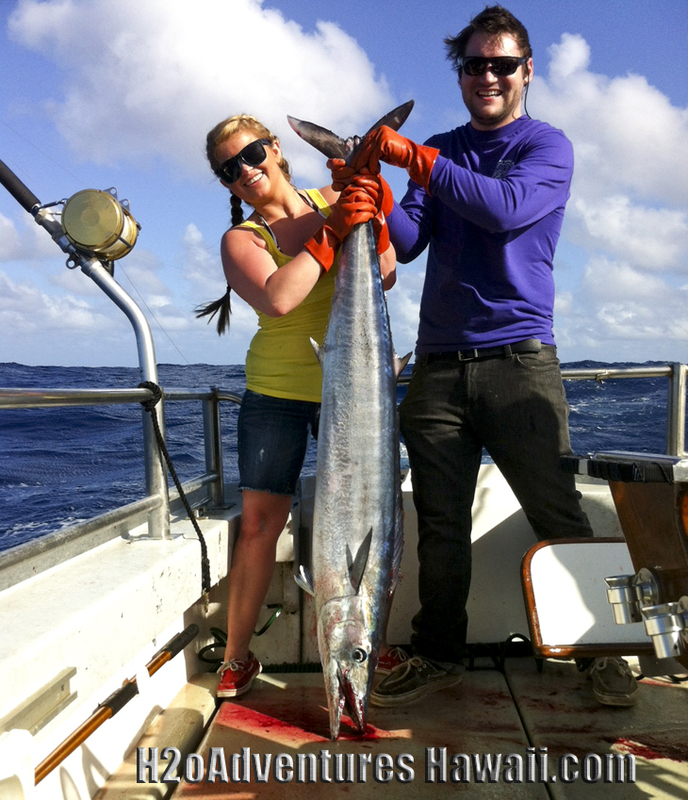 For many fishermen in Hawaii, Wahoo (Ono) are considered an incidental catch and while very popular, are not actively targeted with any specialized methods. Most fishermen will troll their heavy tackle through an area known to have Ono. This is often done when they are on their way offshore to target other species. If they get a bite, it’s not much of a battle on heavy tackle as Ono are known as sprinters and tire quickly when pulling against tackle intended for much larger fish. Once the fish is landed, the fishermen continue on their way offshore leaving any remaining Ono behind. It’s hard to believe that one of Hawaii’s best tasting fish get very little fishing pressure. However, this is not the case with Chupu Charters. After years of refining our technique and locating areas where at certain times of the year the Wahoo (Ono) congregate, spending a day light tackle Wahoo (Ono) fishing with Chupu Charters can be a memorable experience. The best part about Ono fishing with Chupu Charters is that the fishing grounds are close to the harbor. This makes for a great half day charter option, but when the fishing is hot, you will want to be out longer! Ultimately, knowing when the fish are schooling is the key. First, it starts with the conditions. A change in water temperature (cooler can be better) in flat, calm seas with good tidal flow seems to be best. Timing is important as well. Getting an early start and capitalizing on the fish feeding at sunrise will increase your odds as well. To make things fun, we use light tackle! The same fish that could barley even put a bend in a heavy rod will give you a fight you’ll remember when fished on 25 pound test! The savage strikes and blistering runs are so much fun that this style of fishing is at the top of the list for our return anglers who have had a chance to see a Wahoo (Ono) rocket 10 feet in the air and come crashing down on a lure. Ultimately, that’s just the start of the battle. For light tackle stand up anglers or people looking to target smaller game, this is the trip for you! When the conditions are right and the Ono are running, get ready for some great light tackle fun! The Wahoo (Ono) is a dark blue preditor of the open ocean (scombrid) fish found worldwide in tropical and subtropical seas. 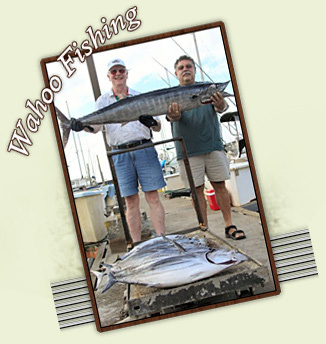 Some say that the name “Wahoo” is a derivation of the name of the Hawaiian Island Oahu, which was sometimes spelled Wahoo, while others say the name derives from the exclamation of some fishermen, “Wahoo!” who have hooked into the extremely fast running fish. The fish is also known as Ono, after the Hawaiian word for “delicious”, ‘ono. The body is elongate and covered with small, scarcely visible, scales; the back is an iridescent blue green, while the sides are silvery, with a pattern of vertical blue bars. These colors fade rapidly at death. The mouth is large, and both the upper and lower jaws have some of the sharpest teeth of any pelagic fish. Growth of this species can be rapid. One specimen tagged at 11 pounds grew to 33 pounds in one year. Wahoo can swim up to 75 kilometers (47 miles) per hour!! The meat of the Wahoo is delicate and white and regarded as very good in quality. This has created some demand for the Wahoo as a premium priced commercial food fish. Wahoo (Ono) can be caught using a variety of artificial lures trolled at high speeds. Wherever found, it is a prized sport fishing catch.